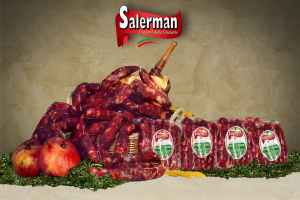 The Salerman’s Ciociara Sausage is crafted according to ancient traditions of Ciociaria with pork carefully selected from local farms, cut the tip of a knife, seasoned and put to mature for 30 days. Its shape is derived from the processing is not always uniform, by hand that led to the creation of a unique product. 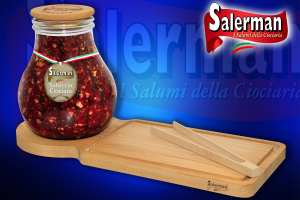 Salerman’s Ciociara Sausage “Black Label” is proposed for the restaurant in the exclusive glass bulb and the elegant cutting board. 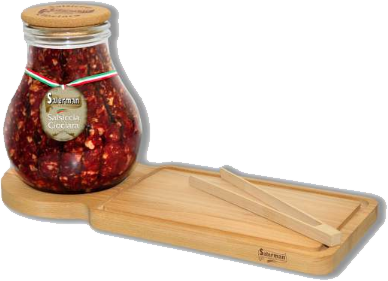 Sweet or spicy flavor with a particularly intense, incredibly apetitose as a starter. 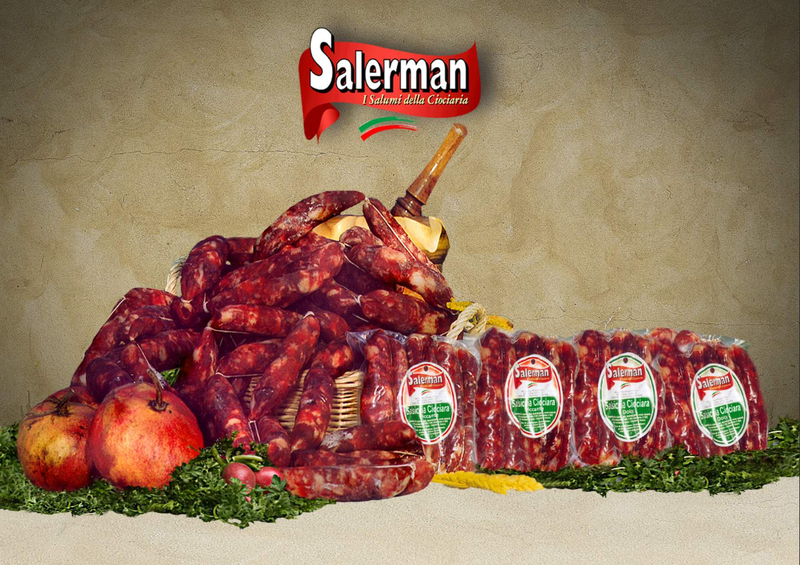 Salerman’s sausage factory is located in a hilltop town in the municipality of Monte San Giovanni Campano in the province of Frosinone, in the heart of Ciociara. From the beginning the company is attentive to the problems of food intolerance and produces food products with no gluten, lactose and dyes. 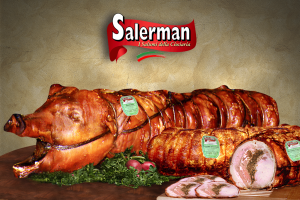 The delicatessen factory of SALERMAN boasts 40 years of professional Ciociaria pork butchery. 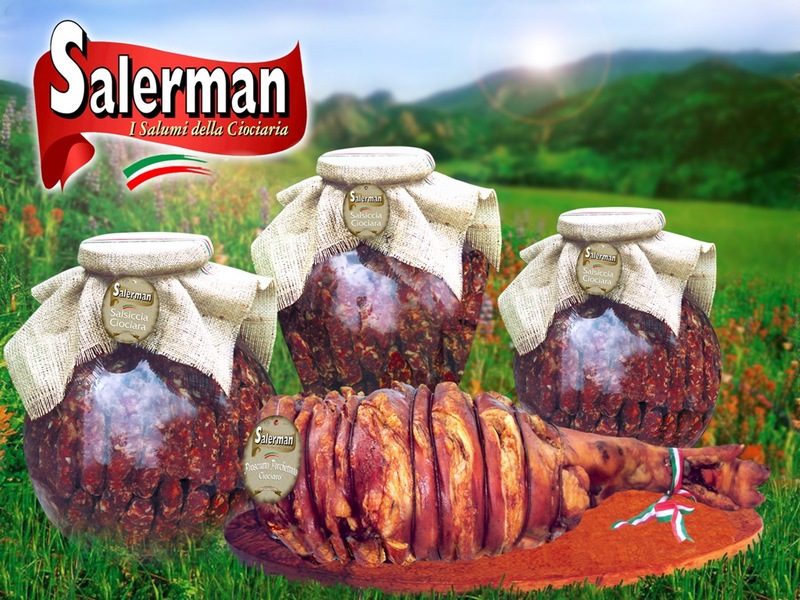 Our companies successful history and of its ciociaria delicatessen production began in 1958. Since then we have remained unchanged and unconditioned in our dedication and rigorous respect to produce excellent traditional salted meat. 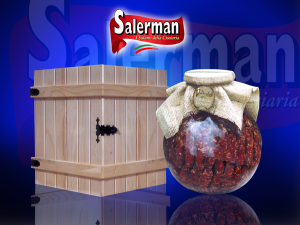 Always consistant, limiting the production, aiming high quality workmanship prefering quality to quantity. The excellent quality of our meat is obtained by accurate selection, the particular attenction with which the complex working stages are paid and a favourable climate determine perfect results of our products. 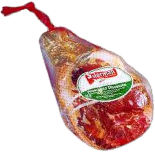 The typical ham of the area is a very special sausage. 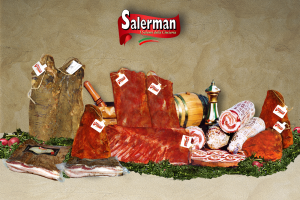 Sweet and tasty, wholesome and balanced nutritional values caused by the supreme quality of the meat, by the wise methods of salting and seasoning, ranging from 20 to 24 months, adopted by master butchers Salerman. 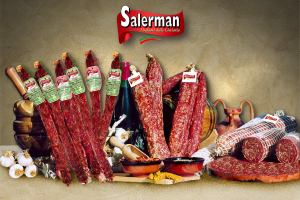 Crafted according to ancient traditions of Ciociaria, the sausage produced at its plants Salerman’s plants is recognizable by its not always uniform appearance, indicating a purely artisan workmanship and manual. 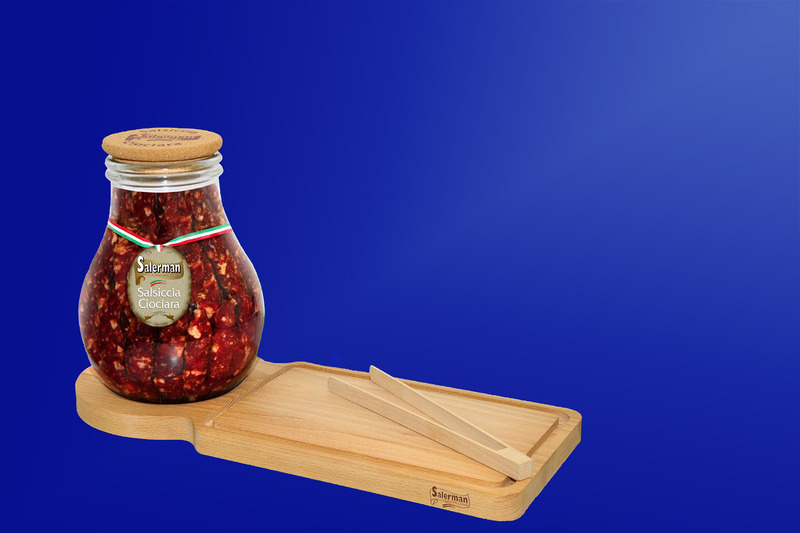 Sweet or spicy and very intense flavor, very good to serve for a delicious and tasty appetizer. Salami, logs, pork, bacon, guanciali, pork neck and coppa di testa. 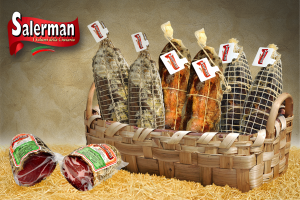 Quality products, processed as usual: ciaociara sausage, porchetta, tronchetto, prosciutto porchettato, prosciutto, salami and stick, capocollo, bacon and guanciale, coppa di testa. 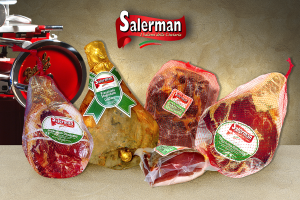 The excellent quality of the meat selected, the attention with which they follow the phases and the favorable climate in which Salerman works its products, determine the success and quality of all meats, which meet increasingly foodies of all region of Italy.